Strategy Battle Game | Azazel's Bitz Box. Convoluted enough post title for you? 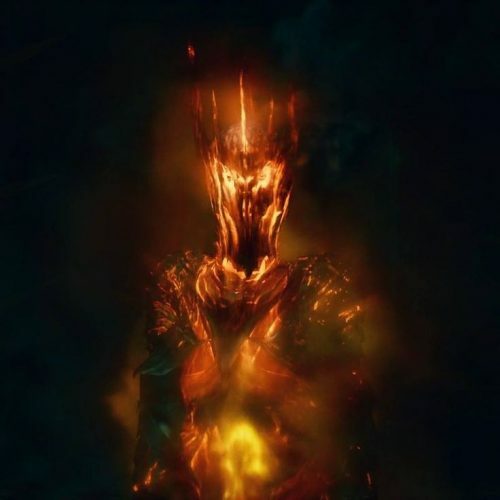 It should actually be worse, since the character of Shagrat should really be called Gorbag if we were going by their actions in the books, and then they should both be Black Uruks of Mordor, and – you know what? Never mind all that for now. Let’s just talk about the toy soldiers instead. So, Shagrat is the one with the heavy armour, shield and sword. He’s also the one pointing, with Frodo’s Mithril shirt. Waitwat? 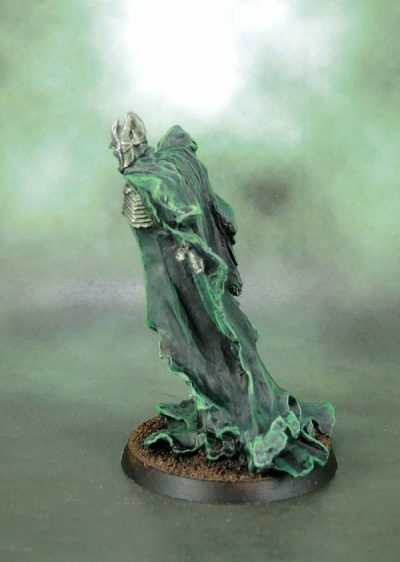 Well, when GW initially released Gorbag and Shagrat (that sounds so dodgy, doesn’t it?) 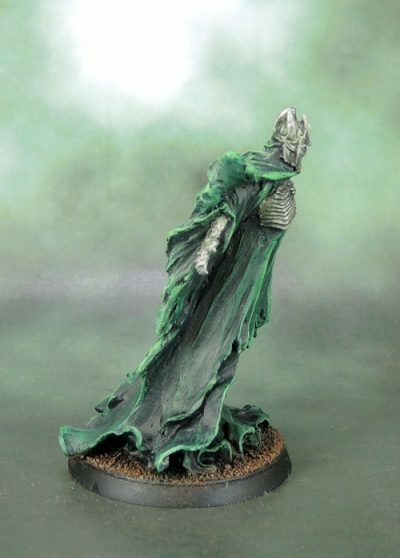 they were doing figures based very much off the films, and so Shagrat got the coat and a pointing pose – probably telling his underlings to kill Gorbag, come to think of it. 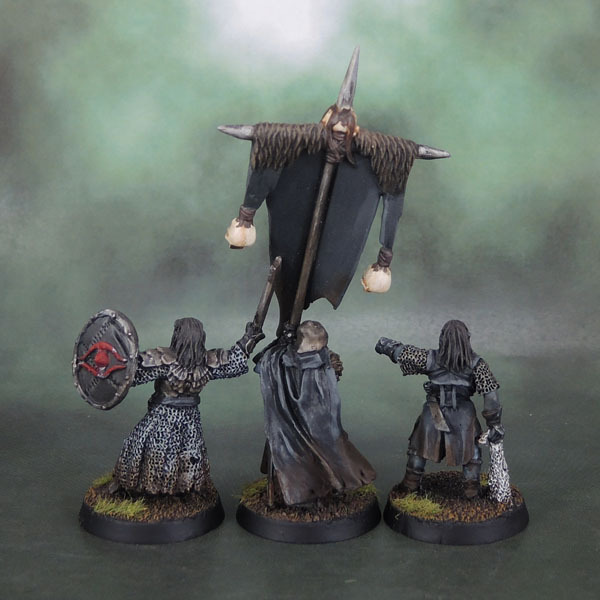 Later on, when GW changed their focus from being more about the films to being more about selling wargames figures for wargaming, they decided that Shagrat didn’t look war-ish enough, and kitted him out with what they decided was Black Uruk Captain’s gear. 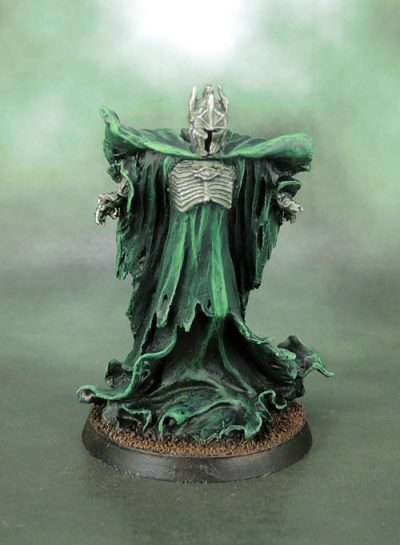 No idea why their painted version of him is blonde, though. That’s just weird. 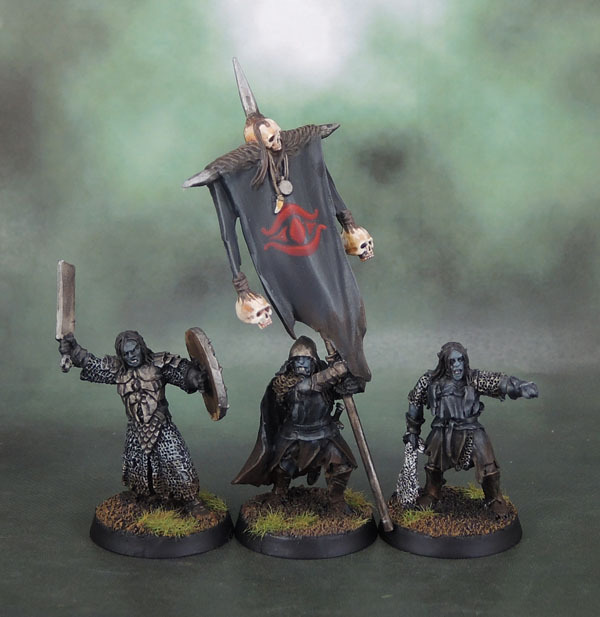 The other model here is a regular Black Uruk, which I had too many dupes of and so converted into a banner bearer using one of the spare plastic banners from either the Chaos Beastmen or Marauders (I’ve got both in the same storage tub). The skulls are pretty oversized, but then I’d say they’re clearly not from humans, and must be from …Half-Trolls. Or something. Not human, though, right? 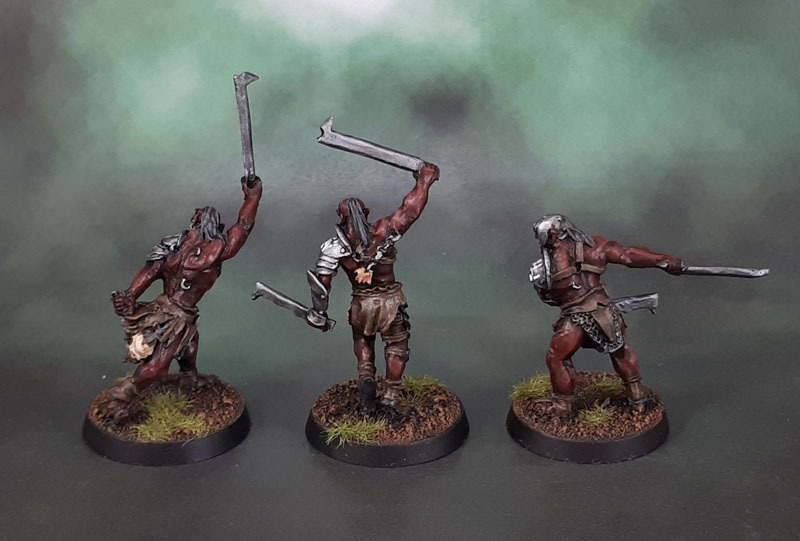 Another group of Uruks. 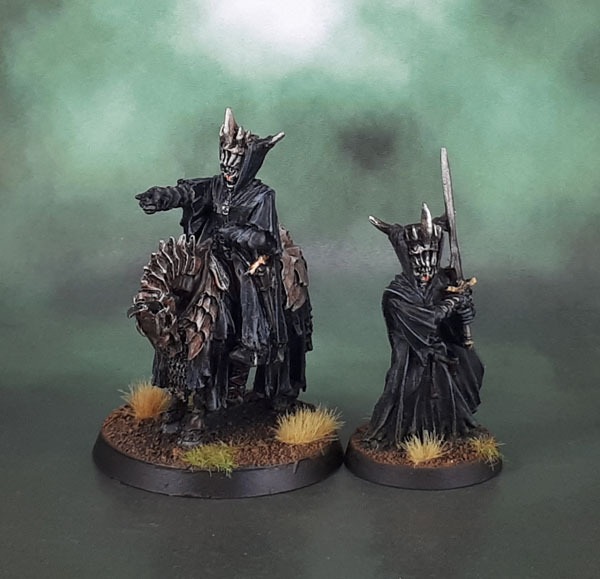 This time, they’re of the Mordor variety. 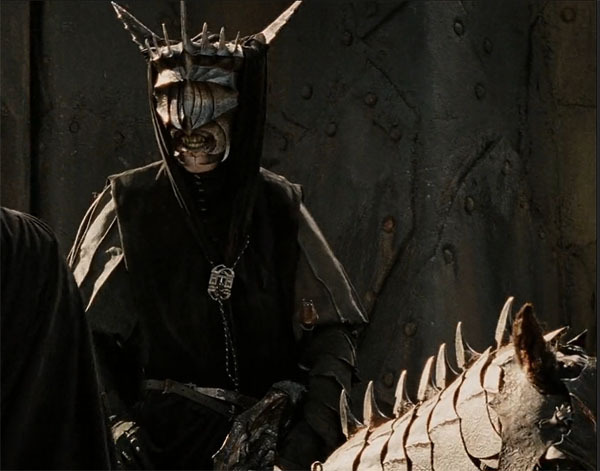 I’ve got a ton of Isengard Uruk-Hai, bu only a small number of Mordor’s Black Uruks. 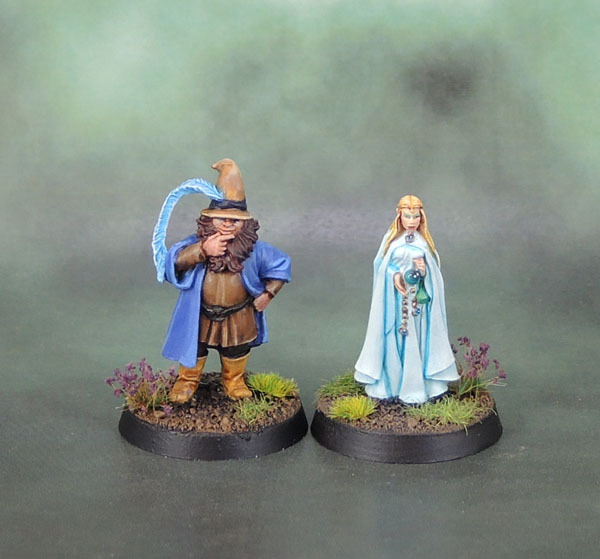 I guess that’s what happens when one type is available in an affordable plastic kit while the other is only available in metal with a very limited number of sculpts (3!) for the first several years. 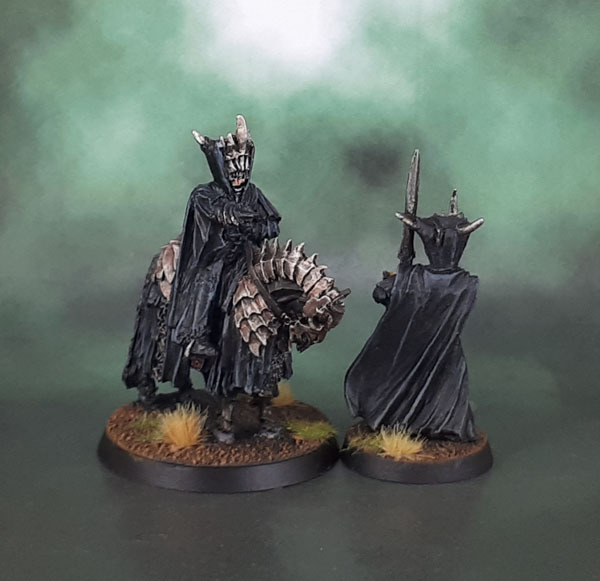 I’ve seen some nice work online on these sculpts featuring a lot of browns, but I wanted to keep my own Black Uruks more literal and stick with black-greys, just using brown as a weathering colour and for the spots of fur on a couple of the models. 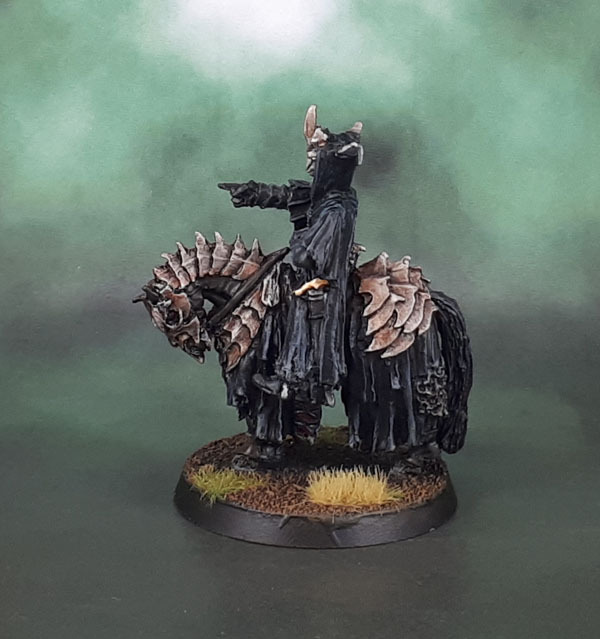 It also lets the weathered, slightly rusted metal of their armour pieces stand out a little more and not look like they’re also made of leather. 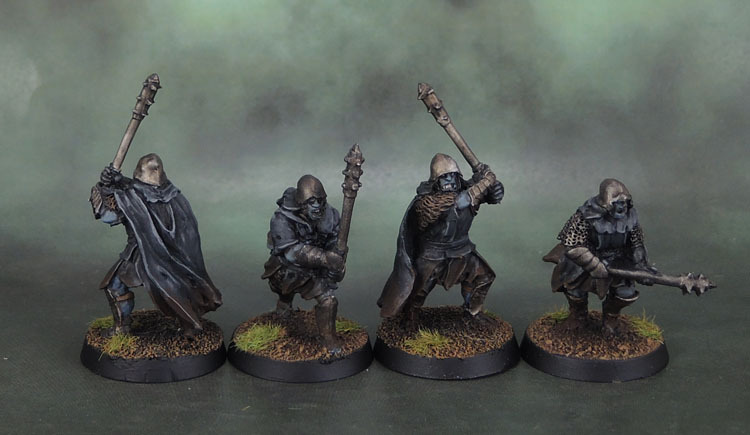 Their flesh is painted simply, using a bluish shade of grey inspired by the films and also to help distinguish their skin from their wargear. I wanted their eyes to look particularly dark, so just a glint of white reflection on a black base, rather than the usual outline-whites-pupils thing that we do. I only gave three of the models shields, which are an option in SBG. In games we’ll either consider them uniformly equipped with or without the shields or play WSIWYG. 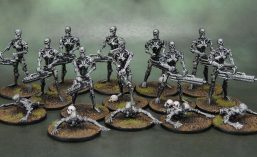 More important to me was to make the duplicated models a little more unique where possible – not always easy when dealing with multiples of metal sculpts. 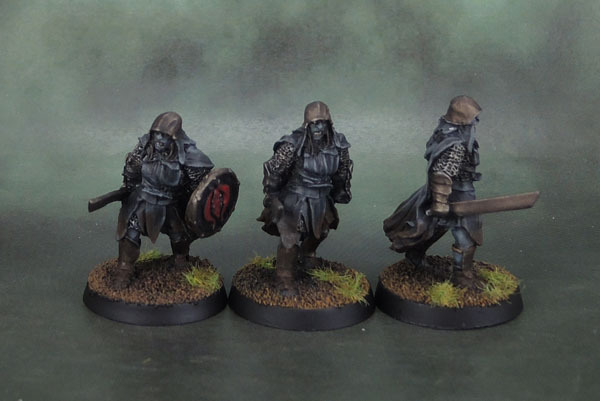 The Mordor shields of the eye are press–moulds of the shields from Citadel’s ME-44 Uruk-Hai models from their original Lord of the Rings range from the 1980’s. 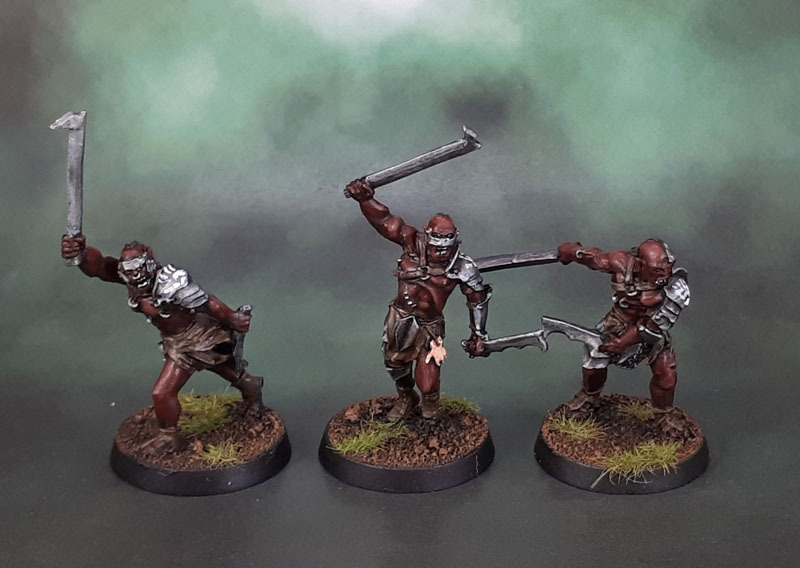 I painted the eye icons in the usual metallic way, then painted the red quite roughly on them, leaving some metal showing due to paint chips and indifferent paintwork by the Uruk troops. 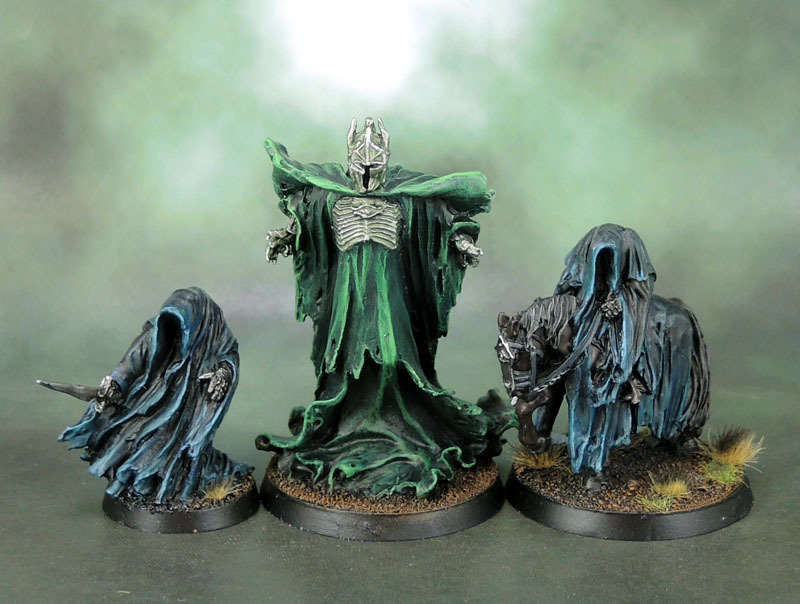 Here’s a group of models that I’ve completed leading into last weekend. 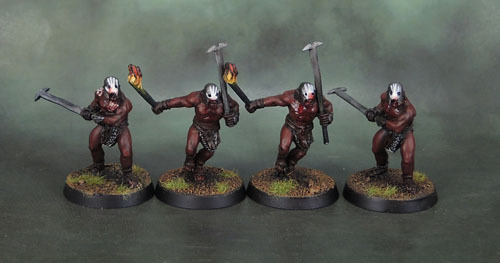 Some were finish-offs and a few were start-to-finish paintjobs, though the scheme for Uruk-Hai Bersekers is pretty simple. 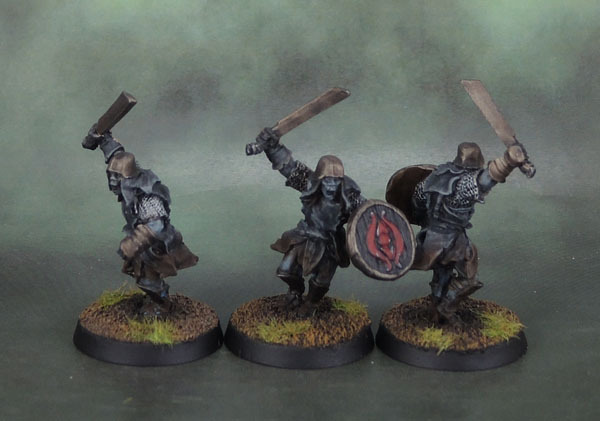 Berserkers are mostly flesh-toned, so that’s pretty straightforward. 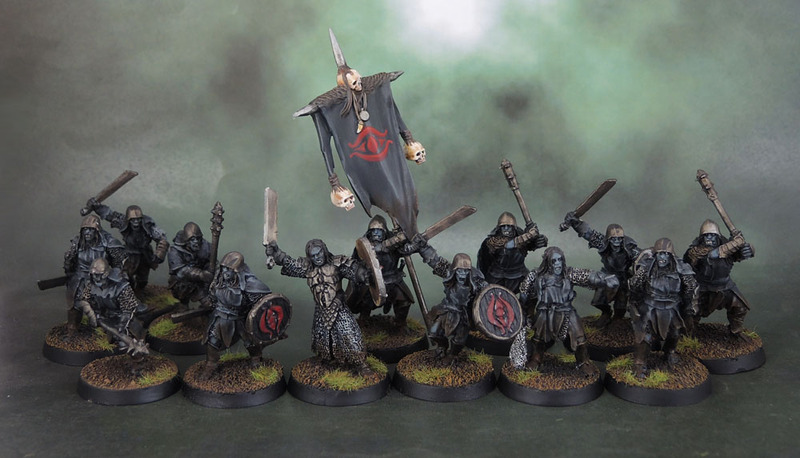 Then dark metal for their helms and greatswords, a bit of chain and dark metal – and done! Ah, and of course some Blood for the Blood God (aka Clear Red) after varnishing down the front of their torsos and a bit of mess on the helms.